Biscuits that look good enough to eat. 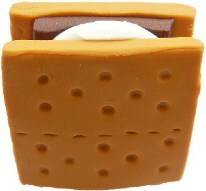 Our new S'mores biscuit range of products are not only cute, but look good enough to wear on any occasion. They have a detailed chocolate and cream design in the centre of the biscuit and come with a trendy gift box. This ring is made from non-toxin polymer clay, silver plated and has a adjustable ring band to fit any size finger. * Please note: Sizes and shapes may vary slightly due to the handmade nature of these types of products. * Not edible or suitable for young children.